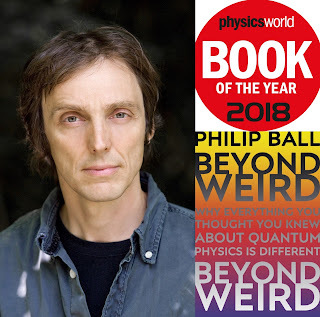 Paul Austin Murphy's : Does Philip Ball Really Move Beyond Quantum Weirdness? In 2018, the science writer Philip Ball had a book published called Beyond Weird: Why Everything You Thought You Knew About Quantum Mechanics is Different. (Did Ball think that the word “wrong”, unlike “different”, was too in-your-face?) In that book he downplays the “weirdness” of quantum mechanics and stresses new approaches to its interpretation. This piece, however, doesn't use Ball's Beyond Weird. Instead it relies on his articles, blogs and a seminar he gave for The Royal Institution. However, it does focus on some of the same issues. The physicist Christopher Fuchs (as quoted by Philip Ball and referred to earlier) expresses the problem of quantum mechanics in terms of “all the posturing and grimacing over [its] paradoxes and mysteries”. In other words, for the layperson especially, that posturing and grimacing seems to have become the very essence of quantum mechanics... And perhaps this is even the case for some physicists too. So why, exactly, does no one understand quantum mechanics? Indeed is it the case that no one understands quantum mechanics? And what does it mean not to understand quantum mechanics? To be honest, I find Feynman's remark rhetorical; as I suspect Philip Ball does. After all, it's fairly well-known that Feynman didn't have too much time for the interpretations1 of quantum mechanics, let alone for the philosophy of quantum mechanics. In other words, Feynman knew all (or at least most) of the relevant maths. “The trouble was”, as Ball puts it, “that's all he could do”. Thus the “theory works”; though “without our knowing what it's about”. And that surely wouldn't be such a bad thing if physicists believed that there's no real answer to the what-is-it-about question. Perhaps some (or even many) do believe that. So what do the words, “What the maths mean”, mean? What does the maths describe? What is there beyond the maths (if anything)? Does the mathematics alone give us a full understanding? “[I can't accept quantum mechanics because] I like to think the moon is there even if I am not looking at it." My position is that the anti-realist stance on “the world” (or “nature”) is similar to the Copenhagen interpretation of quantum mechanics. However, whereas Niels Bohr and others might have mentioned measurements, experiments and whatnot; anti-realists have talked of verification, observation, the “public nature of meaning”, etc. Indeed these differences in jargon may not count for much; at least within this limited context. “[a]t the root of the matter is the issue of whether quantum theory pronounces on the nature of reality (a so-called ontic theory) or merely on our allowed knowledge of it (an epistemic theory)”. Perhaps Ball should brush up on his contemporary philosophy. Most/all anti-realists don't “deny any reality beyond what we can measure”. They say (to put it simply) that this “mind-independent” reality serves hardly any purpose. And anti-realists also believe this for similar reasons to that given by Niels Bohr (whom Ball then quotes). So perhaps, like so many others, Ball is guilty of fusing anti-realism with idealism - or even with postmodern quackery! Philosophical anti-realists would be (more or less) happy with that quote. So, again, it's odd that Ball seems to have a negative view of anti-realism. Perhaps this boils down to the brazen technical term that is “anti-realism”. After all, this term can be read as a philosophical position that is against the real! One can understand the idealist smell of the quote directly above. Nonetheless, the fact that “'observations not only disturb what has to be measured, they produce it” doesn't mean that that there wasn't a reality (or a something) which was measured in the first place. There was. That something (John Locke's “Something, I know not what”?) was disturbed. So there's an acceptance here that there was a something which was disturbed. It's not as if this something was created out of the blue. After all, the very words “disturbed” and “measured” show us that there was something that was disturbed or measured! Stressing observations or measurements clearly doesn't factor out what is that's observed or measured. “'[i]t is wrong to think that the task of physics is to find out how nature is. Physics concerns what we can say about nature'”. “standard Bayesian probability theory assumes, probabilities – including quantum probabilities – 'are not real things out in the world; their only existence is in quantifying personal degrees of belief of what might happen'”. In a certain sense, this is stronger than anti-realism in that an anti-realist would never feel the need (I guess) to use a phrase like “moments of creation”. Thus we accept the “pre-existent” without also saying that we can “reveal” it in its complete fullness. Indeed if we don't reveal the pre-existent, then what point does it play? Kant, for one, gave many reasons to accept the importance of noumena – or of the preexistent. Fuchs, on the other hand, appears to erase it from the picture. This is very tricky. If the pre-existent were different, then surely the “moments of creation” would be different too. And if that's the case, then how can the pre-existent be entirely erased from the picture? Clearly these moments of creation can't be autonomous. They are restrained by the pre-existent. Thus any creation carried out by a physicist is restrained by – and dependent upon – the preexistent. In other words, if we take Fuchs literally and non-rhetorically, his position is essentially idealistic! Philip Ball applies more or less the same arguments found above to the specific and well-known case of Schrödinger's cat. “in neither the Copenhagen nor the Many Worlds interpretation is the cat 'simultaneously alive and dead'”. “I think Bohr might have said something along the lines that 'Observation allows us to speak about the classical state of the cat. And look, it is a dead one!'." In other words, until we get information about the cat, we don't know if it's alive or dead. It's not the case that it's both alive and dead at one and the same time (i.e., before we gain that information). However, until we get that information (as with anti-realism), the cat may as well be both alive and dead... in a manner of speaking! Ball also offers up a more original take on the cat scenario. When one reads it, it seems extremely simple yet also powerful. I don't know about “well-defined quantum states”: a live cat and a dead cat (both together or separately) don't seem to be quantum states at all. Perhaps that doesn't matter. After all, what's happening here is that we're applying a quantum-mechanical situation (or possibility) to the “real world” - to a cat! And what's wrong with that? What exactly is it for a cat (or anything else) to be both alive and dead at one and the same time? If we can't even say what we mean in the first place, then what exactly are we talking about? This isn't a philistine (or “positivist”) rejection of “modal theorising” or though-experiments: it's just a demand that we define our terms, concepts or variables before we get the ball rolling. Yet Ball argues that “here language is articulating something that underpins maths, which is logic”. If you go with the maths rather than the logic (as it were), then we'll inevitably have some strange scenarios to deal with. Ball cites the physicist Brian Greene's position on the cat again. Greene is quoted as saying: “Your cat is dead, but your cat remains alive.” What's more, Greene adds: “That is you too!”. Yes, “[t]hey are both you”! “whole talk of waves versus particles, quantization and so on has made many people gravitate toward interpretations where wavefunctions represent some kind of actual physical wave property, creating a lot of confusion”. Indeed Schlosshauer concludes by saying that “[q]uantum mechanics is not a descriptive theory of nature”. In other words, there is no literal or physical reality which the wavefunction captures. The wavefunction is a product of our knowledge or “information” and also a “mathematical object”. And we only know any actualities (not the probabilities) when the wavefunction is “collapsed” - perhaps not even then. “x actually is in all these places it could be at the same time”? Thus a particle is not “in many places at once”. It could be in many different places – but not at one and the same time. Being in difference places at one and the same time is not the same as the possibility it could be in many different places. In addition, particle x possibly being in either spin up or spin down, for example, isn't the same as that particle actually being in spin up and spin down - at one and the same time. In other words, a photon isn't in both spin up and spin down at one and the same time. Instead, we simply have the “information” that it can be either in spin-state up or spin-state down. Until a measurement is made, we simply don't know which one it is in. As stated, all this ties into the stress which Ball places on information. Indeed, despite his view on philosophical anti-realism, information plays almost the same role as observation, verification and whatnot do in anti-realist philosophy. “'fundamentally a theory about the representation and manipulation of information, not a theory about the mechanics of nonclassical waves or particles'”. Thus there's a distinction between what is and the information we have about what is. This, again, is simple anti-realism. It seems, therefore, that in accordance with the quote above, Fuchs is partly at one with Searle on this. iii) then what do we have left? ii) then there's a danger of moving from Ball's tired old cliches and metaphors to new cliches and metaphors if we don't realise that. This, then, may be the only route possible for Ball. However, it leaves the layperson - and even many physicists - will very little to say about quantum mechanics... beyond the mathematics. 1) To state the obvious: the interpretations of quantum mechanics are, well, interpretations. It's hard to grasp what kind of standing a particular interpretation of quantum mechanics could actually have. The very word “interpretation” seems to deflate what it is that's being done – at least from a scientific perspective. Does an interpretation become something else when it is proven or simply established as true or correct? Do any interpretators of quantum mechanics believe that their own interpretations can be proven? What would that mean? 2) In very broad terms, it can easily be argued that there is no “nature of reality” that can exist separately from - as Philip Ball puts it - “our allowed knowledge of it” . Indeed I would even suggest that the “ontic” position hardly makes sense. What does it mean to have a view of reality that is completely divorced from our tools for gaining knowledge of that reality? 4) John Searle argues that causes and effects - as well as the systems to which they belong - don't have any information independently of minds. However, that doesn't stop it from being the case that these causes and effects can become information due to direct observations, etc. of them. Searle's position on information can actually be said to be an account of what's called “Shannon information”. This kind of information is “observer-relative information”. In other words, it doesn't exist as information until an observer takes it as information.